The Galaxy S7 Active continues Samsung’s tradition of releasing a military standard-grade phone that draws much of its inspiration from the latest Galaxy S flagship, while adding a little something extra that some consumers want. 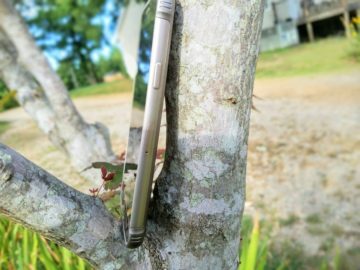 Many have said that the Galaxy Note 7 is “an S7 edge with an S Pen,” but the Galaxy S7 Active can be called “the true Galaxy S7 Plus” without raised eyebrows: it has the same display, cameras, SoC, internal storage, microSD card slot, and pre-installed Android Marshmallow as the Galaxy S7 and Galaxy S7 edge, but brings the coveted Active key, new Sandy Gold color, shock-resistant build, and larger battery. 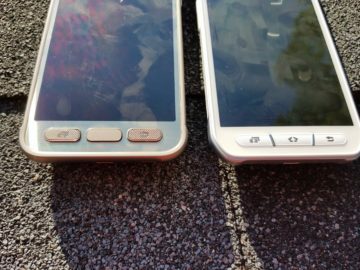 Since the Galaxy S7 Active is really a Galaxy S7 “plus” the extra, we won’t waste too much discussion on the similarities, though we will provide a photo gallery for your viewing. For those who want to see more discussion on the display, cameras, and Marshmallow update, we encourage you to view our Galaxy S7 review. 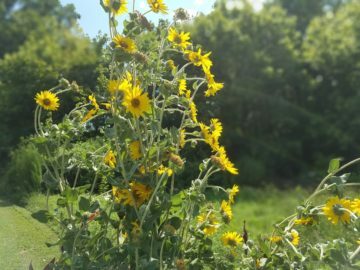 Before diving in, I’d like to give some background on my last near eight weeks with the Galaxy S7 Active. I’ve been using a Galaxy S7 Active with a 10GB 4G data plan. I have tested battery life in the device with the SIM card inserted and without the SIM card. 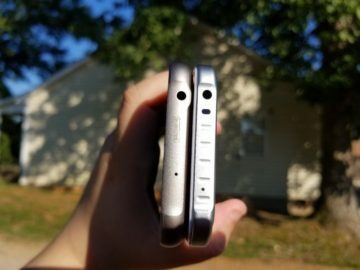 Now with all the preliminaries out of the way, let’s first cover changes between the Galaxy S7 Active and its immediate predecessor (the Galaxy S6 Active). The Galaxy S7 Active has dimensions of 148.8 x 75.0 x 9.9mm, while its predecessor the S6 Active has dimensions of 146.8 x 73.4 x 8.6mm (per AT&T’s website), with the battery being one of the factors contributing to the S7 Active’s additional “heft.” The Galaxy S7 Active has a new color this year, Sandy Gold, a color that didn’t exist with the Galaxy S6 Active and a color that we think consumers will choose over the traditional white/gray and black/gray color offerings. 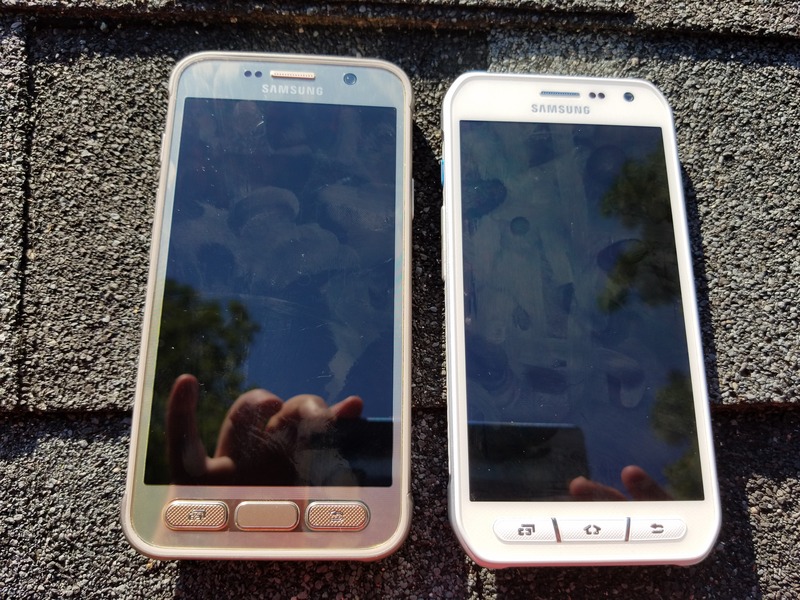 I was told by my eBay seller that I should get the black S7 Active instead, but having used the Sandy Gold S7 Active for the last near eight weeks, I’d have to say I couldn’t disagree with him more. The Sandy Gold brings such beauty to the S7 Active that it even makes the back AT&T logo look good — and I never deemed that possible. 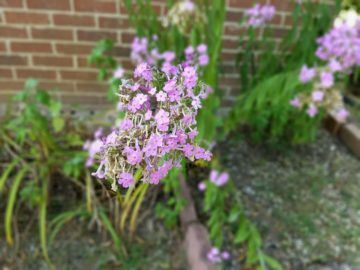 Sure, you’ve seen some photos of the Sandy Gold Galaxy S7 Active that turn you away, but I implore you: visit your local AT&T retail store and look at the phone up-close before you make a decision to be forever turned off by it. Seeing it in person will change your mind about the phone. You just may end up buying one before you leave. 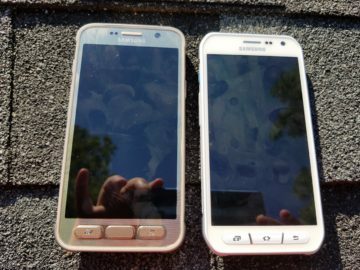 Apart from the Sandy Gold color for the Galaxy S7 Active, the S7 Active has some slight cosmetic tweaks from its 2015 predecessor. 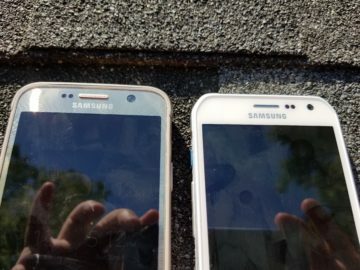 Samsung has kept the front camera in the same place on the S7 Active as they did on the S6 Active but has moved the proximity and gesture sensors from the right side on the S6 Active to the left side of the earpiece on the Galaxy S7 Active. The front camera seems larger on the S7 Active this year. The earpiece on the S7 Active looks more pronounced this year than it did on the S6 Active, which will help improve phone call quality and communication. 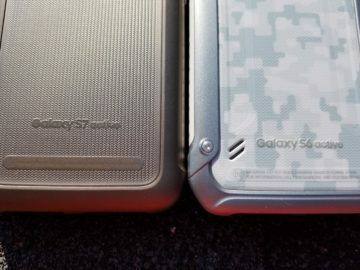 The front panel of the S6 Active has a rather slight hexagonal print, whereas the S7 Active features something of a ribbed line design on its front panel. The speaker, located on the back of the S6 Active, is now located on the bottom of the S7 Active — a move that is bound to make some phone users rejoice because of the speaker’s improved location and audio output. Looking down at the very bottom of the front displays of both phones, there is something else to notice: Samsung has made some changes in the navigation button layout. 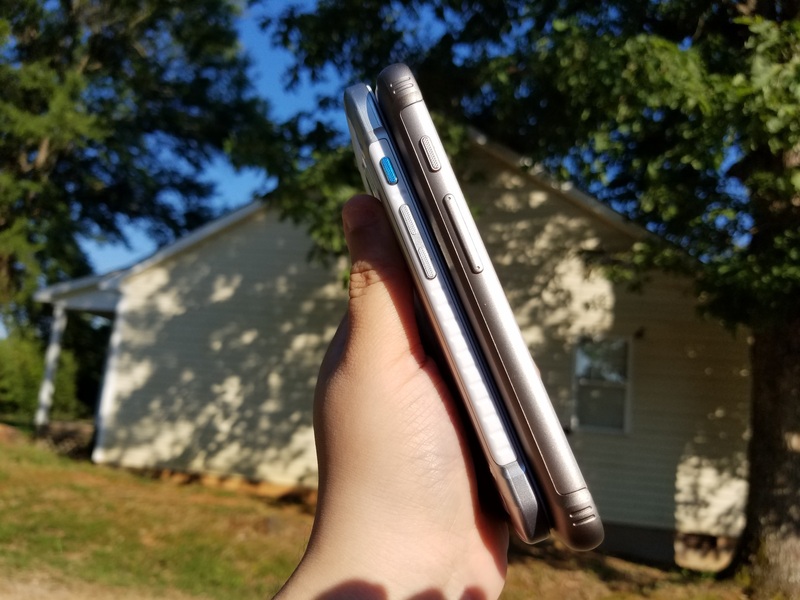 Whereas with the S6 Active Samsung connected the pages, home, and back buttons together, the Korean giant severed them on the Galaxy S7 Active this year. Now, you have three separate buttons for the same functions instead of three buttons connected together that look as though they comprise one long button at first glance. The home symbol on the home button on the S6 Active has been ditched this year on the Galaxy S7 Active. 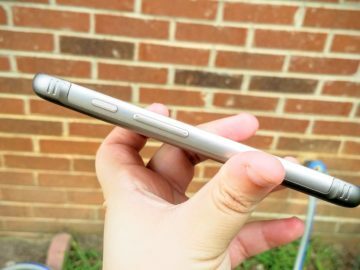 The headphone jack and microphone both remain atop the S7 Active as they did in the S6 Active, but Samsung has gone ahead and removed the IR blaster from the S7 Active. The IR blaster was present in the 2015 Active smartphone as well as the Galaxy S6 and Galaxy S6 edge, but Samsung removed it from the Galaxy Note 5. As is the case with all Samsung’s flagships, the S7 Active now gets the updated plan that was first present in the Note 5 — and the IR blaster is gone in the S7 Active as well as the Galaxy S7 and Galaxy S7 edge. This isn’t intended to make a big deal about it, but simply to inform consumers who may buy this handset because of the IR blaster and become disappointed to find it gone later on. On the backs of the two phones, you’ll notice that Samsung has taken the square camera shape and circular LED flash and heart rate monitor of the S6 Active and has rounded the corners of the rear camera and “squared” the flash/heart rate monitor on the S7 Active. 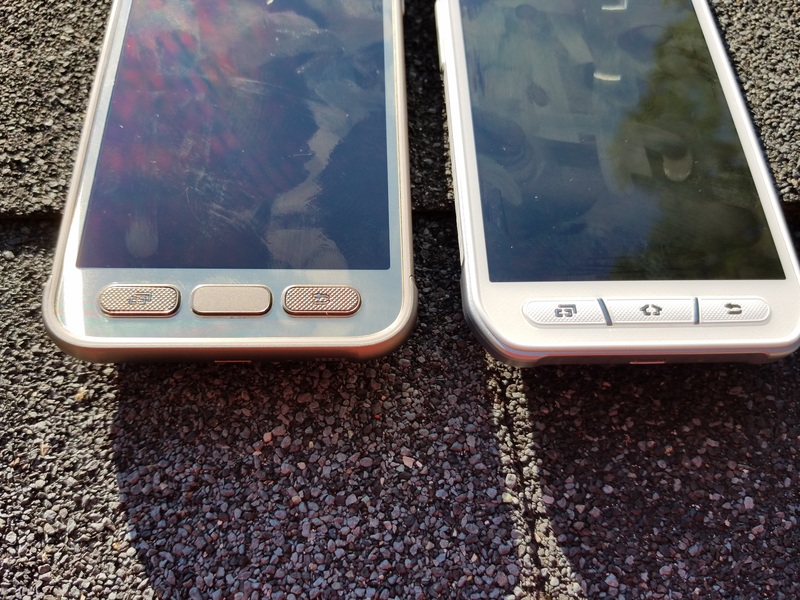 The AT&T logo and phone monikers, though different, remain in their respective places, with this year’s S7 Active forgoing the bolts found on the back cover of the S6 Active. 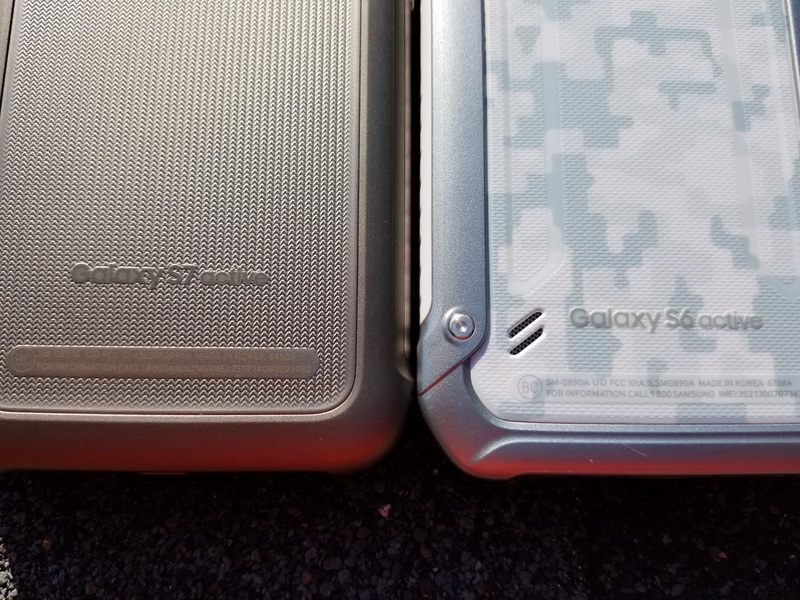 The plastic sides of the S6 Active have been replaced with rubber sides, providing better grip and firmness in-hand than the S7 Active’s immediate predecessor. 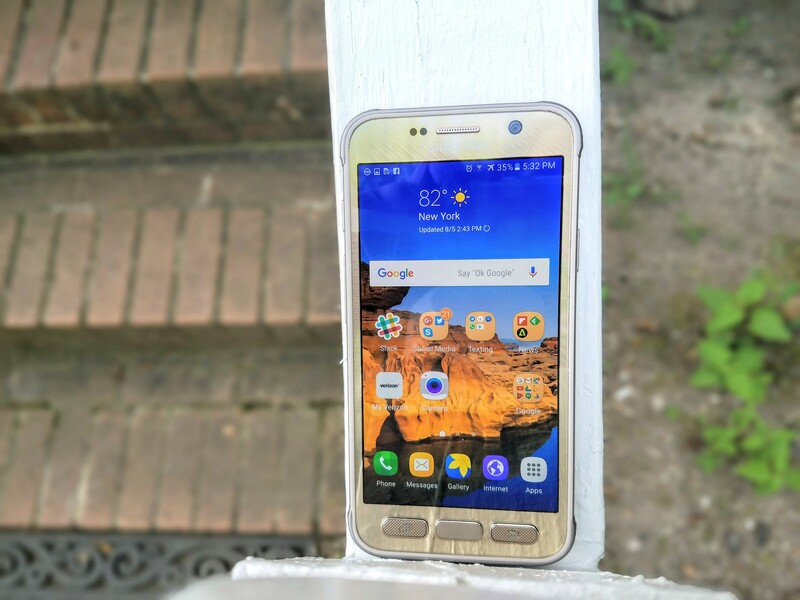 The Galaxy S7 Active has the same 5.1-inch, Quad HD Super AMOLED display with Gorilla Glass 4 as does the Galaxy S7, which means that the device has a pixel density of 576 PPI (one of the top pixel densities in the industry). 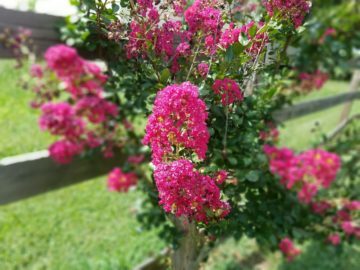 With Samsung’s Super AMOLED display, you’re looking at punchy, saturated colors, and it seems that Samsung hasn’t tuned the punchy colors on the S7 Active as much as the Korean giant did on the Galaxy S7 and Galaxy S7 edge. Color calibration is slightly better on the popular flagships (the Galaxy S7, S7 edge, and the Galaxy Note 7), though the Samsung quality remains with the Active series. There are three layers to the Galaxy S7 Active display, though. First, there’s a plastic layer, similar to what teardowns have revealed for the Motorola Droid Turbo 2. And, to many consumers’ surprise, the S7 Active’s plastic panel scratches at a level 3 on the Mohs hardness test and is not resistant to metal and metal scratches. 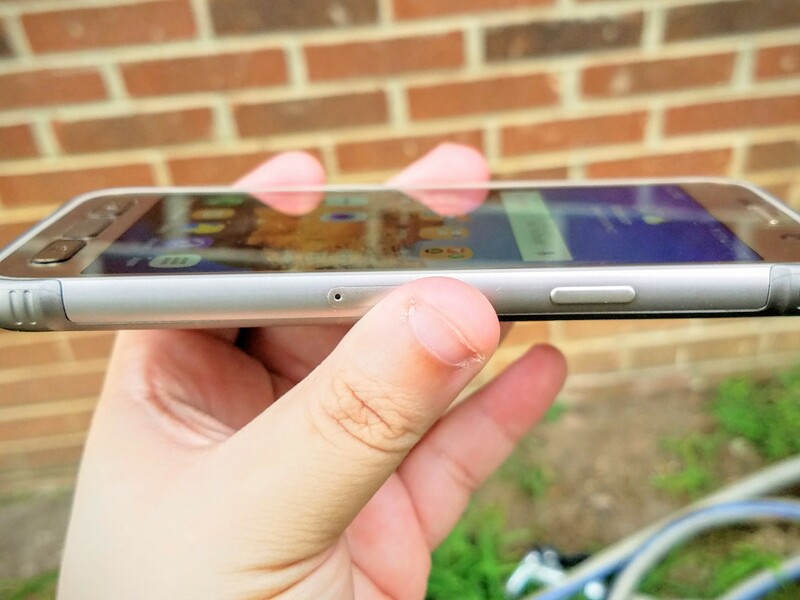 Your car keys will scratch the S7 Active if they’re placed in the same pocket — so don’t do this. One of the most interesting facts to know about the Galaxy S7 Active is that it boasts a shatter-resistant display that is “shatter-resistant up to 5 feet on a flat surface,” Samsung says. 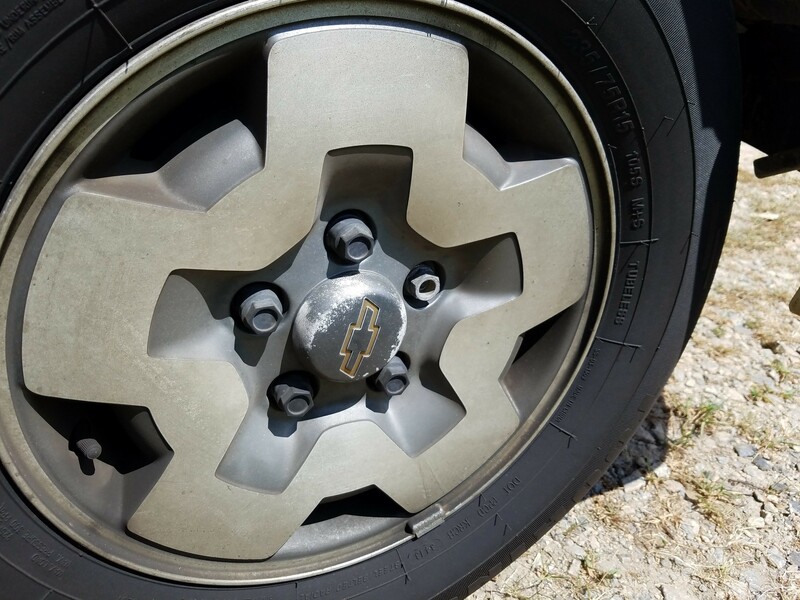 We don’t recommend you dropping this onto an incline or above 5 feet in the air, or going outside of the parameters of the company’s shatter resistance certification to see just how far you can push this feature. 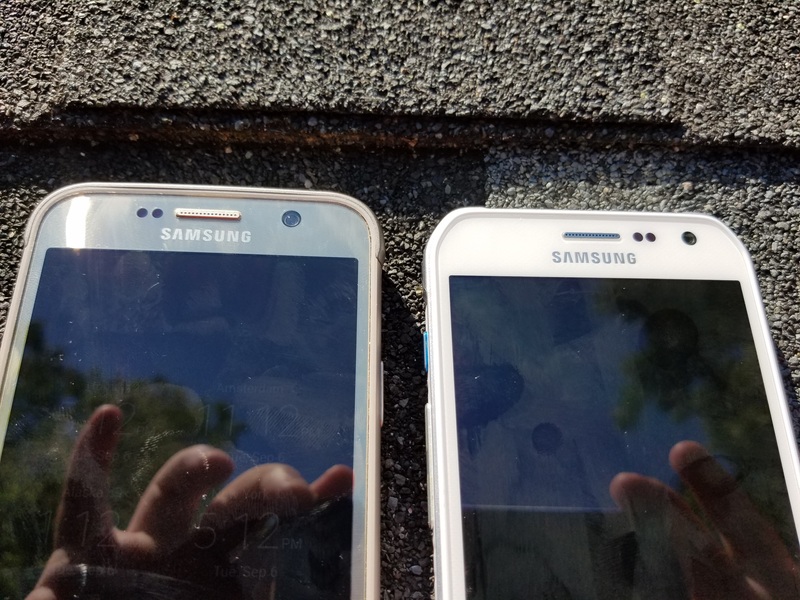 Samsung has not provided any statements on how it was able to create a shatter-resistant display, but teardowns reveal that Samsung has used a plastic top layer, a Gorilla Glass 4 layer in the middle, and an AMOLED display layer on the bottom of the panel to create the shatter-resistant durability that makes the S7 Active an absolute joy to use (and tumble) about. 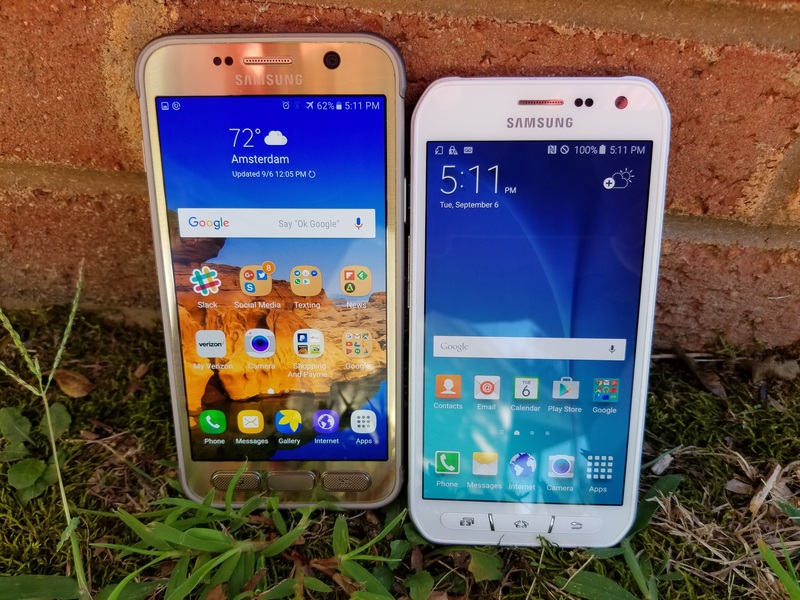 The Galaxy S7 Active features the same quad-core, Qualcomm Snapdragon 820 SoC and 4GB of LPDDR4 RAM as the Galaxy S7, Galaxy S7 edge, and the newly announced Galaxy Note 7. What this means is that buyers are getting the same raw power in the S7 Active that all other high-end Samsung Galaxy customers will receive in 2016. The latest Active device from Samsung does return to Qualcomm SoCs after a year of flirtation with Samsung’s own homegrown Exynos 7420 SoC. Samsung’s Exynos processors have performed better in my experience, in not only battery life but also their general performance (particularly, very, very little device warming whatsoever), but carrier demand has pushed Samsung back to Qualcomm once again. The Snapdragon 820 doesn’t live up to the “hotness,” literally, of its predecessor the Snapdragon 810, but it still has instances of warming (though fewer than my Galaxy S7 edge had at the time of its arrival on my doorstep). 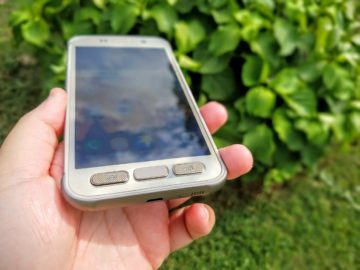 With the extra ruggedized build, though, what could turn out to be a “hot potato” is stopped: the rugged build helps to prevent excessive heat and warming to the touch that could easily arrive with the glass-backed Galaxy S7 and Galaxy S7 edge. In other words, the Galaxy S7 Active is not only water and dust-resistant, and shatter-resistant due to its display, but also weather and element-resistant. 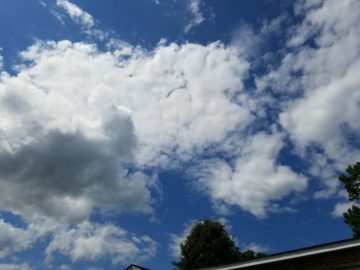 In my time with the Galaxy S7 Active outdoors, the back of the device warmed because of the extreme 90+-degree Fahrenheit temperatures here in the US, but the device did not overheat outdoors or cause any danger to the device while I was using the S7 Active to take pictures of the Galaxy S7 edge and then, the Galaxy Note 7. 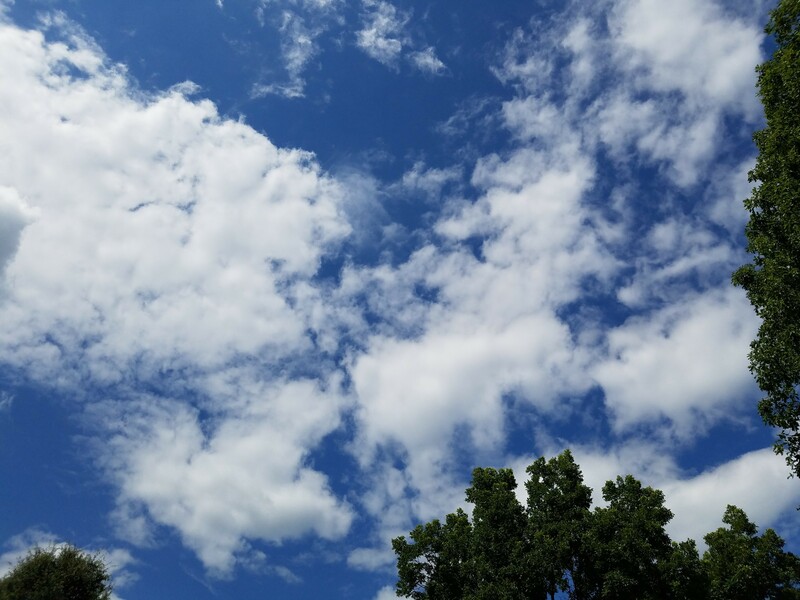 Weather resistance (not just water and dust resistance but even heat resistance) is a category I hope to see with the Active series in the years to come in some form of official certification. The Galaxy S7 Active has 32GB of internal storage with a microSD card slot that can house an additional 200GB of microSD storage (microSD card sold separately, mind you). 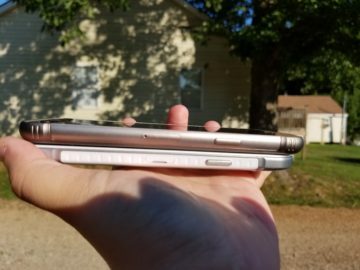 This matches the same internal storage as that of the Galaxy S7 and Galaxy S7 edge but is less than the 256GB of storage Samsung just announced in the Galaxy Note 7. 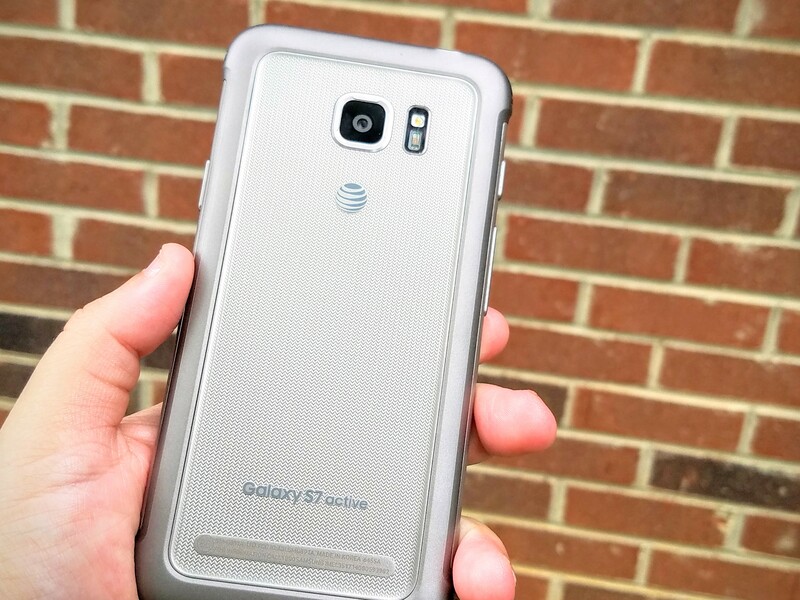 The Galaxy S7 Active, as is the case with its immediate predecessor, brings UFS 2.0 storage for faster read/write and data transfer speeds, but Samsung has also re-implemented the microSD card for those who still see microSD storage as essential to their productivity and way of life. 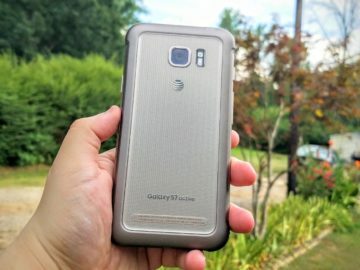 Galaxy S7 Active buyers will have 21.9GB available out of the box (10GB eliminated), with 9GB going to System Memory and nearly 1GB of additional used space. 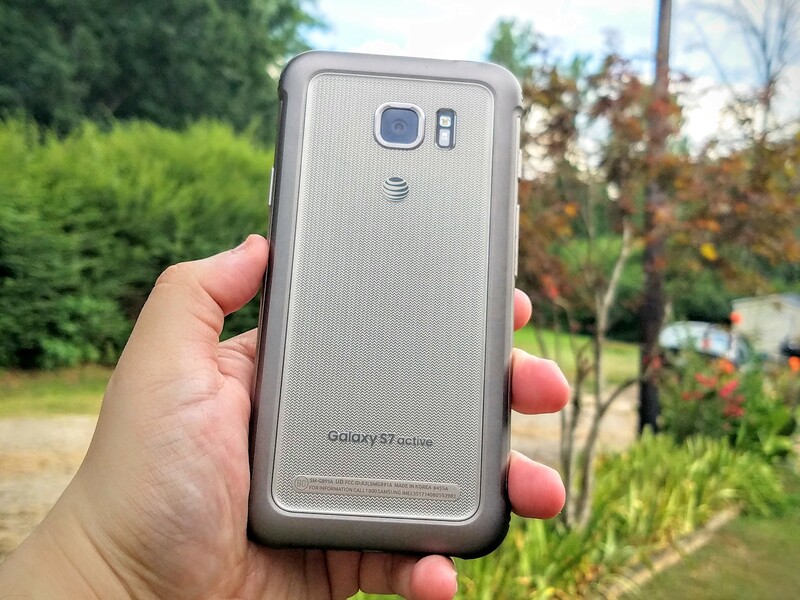 The Galaxy S7 Active houses a 4,000mAh battery, considered to be one of the largest batteries the Korean giant implemented in this year’s large “Galaxy” with its numerous smartphones. The only phone you’ve likely heard of in Samsung’s arsenal that surpasses the S7 Active in battery capacity would have to be the Galaxy A9 Pro with its 5,000mAh battery. 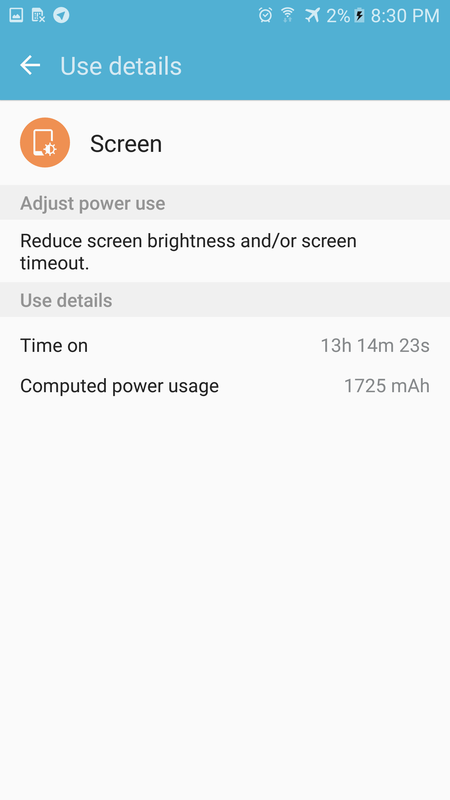 The Galaxy S7 Active works wonderfully when it comes to battery performance. I was able to get 30 hours (minimum) on most charges, and, on days when I was a “busy bee” at work, I could get as much as 2 days (almost 2.5 days) on a single charge, with between 10-14 hours SOT. Sure, as with all smartphones, there are days when my battery life and screen-on time (SOT) differ from the claim made here, but that is the case with all smartphone users. What I say here is done to give you an overall picture of what battery life has been like consistently. The long battery life is one of the major advantages of the Active series. The battery life here is so good that when you experience something like the Galaxy Note 7, you’ll notice the difference in optimization and battery performance (if you don’t use the Medium Power Saving Mode, that is). Let’s just say that the Galaxy S7 Active has convinced me that AT&T customers in the US are some of the most privileged customers on earth (though there are some tangible evidences that convince me to the contrary, too. We’ll get into those by the end of this review). The S7 Active comes with Samsung’s long-lived micro-USB charging, so it’s likely that picking up this handset, you’ll have a few Samsung micro-USB chargers lying around the house. 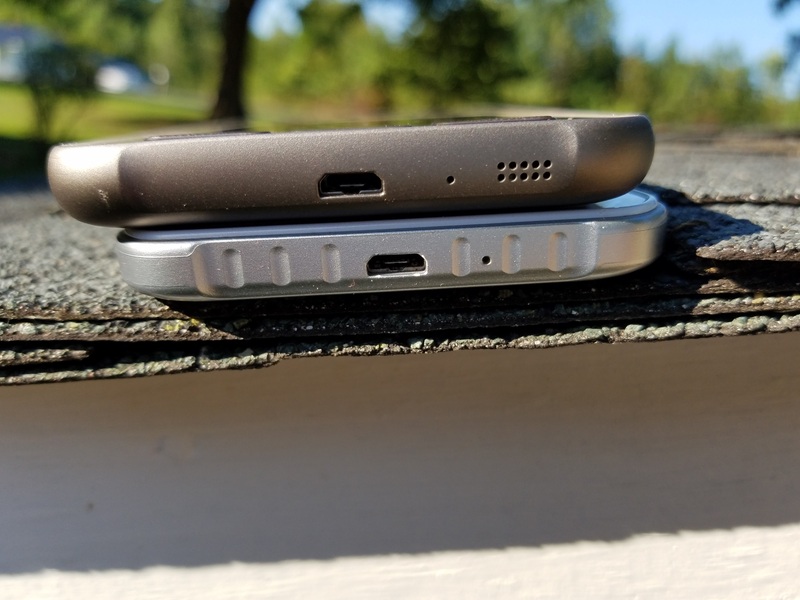 If you decide to USB-C charge the device, you’ll go from 0 to 100 in less than 2 hours. As for fast wireless charging, however, you can expect to wirelessly charge the device in about 2.5-3 hours. 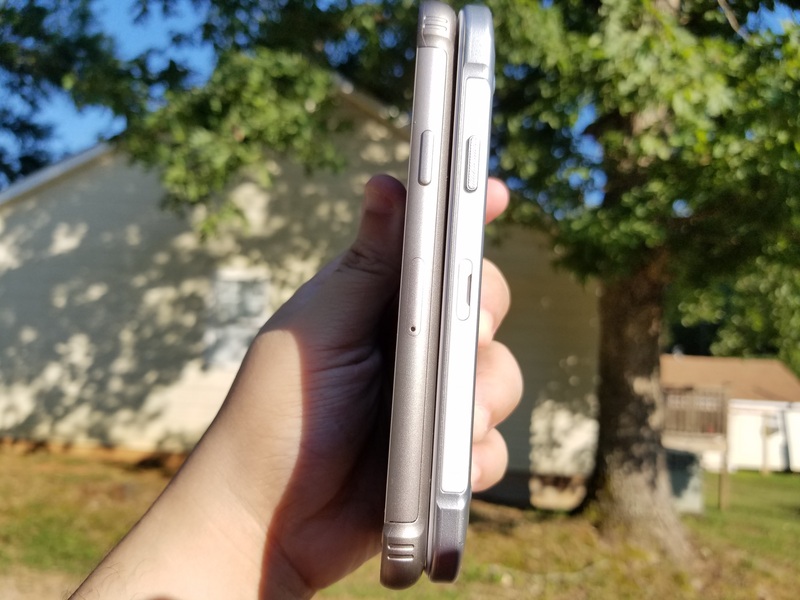 The beastly battery stats are below, but beware: the Active smartphone series has been known to elicit a health condition of smartphone dissatisfaction with all other smartphone flagships. 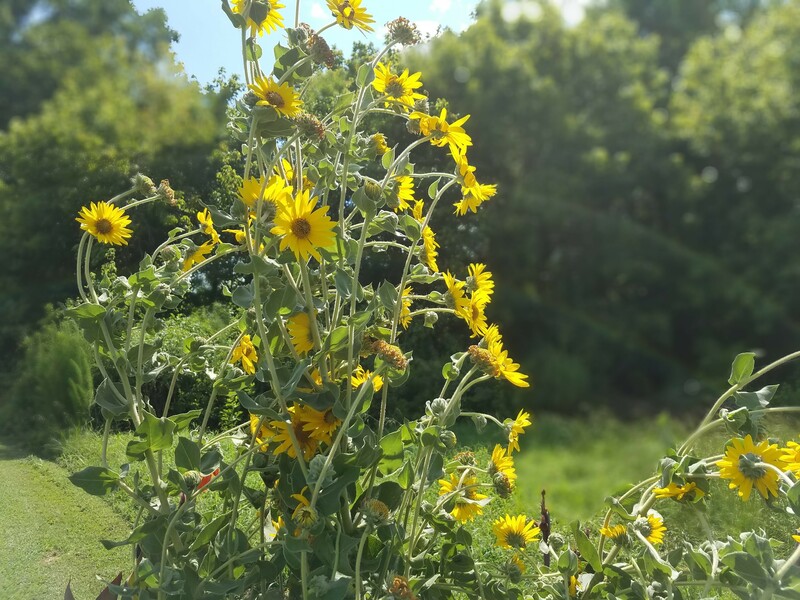 The Galaxy S7 Active features the same 5MP front camera and 12MP back camera with Dual Pixel phase detection autofocus (PDAF) that you’ve seen in the Galaxy S7, Galaxy S7 edge, and now in the Galaxy Note 7. 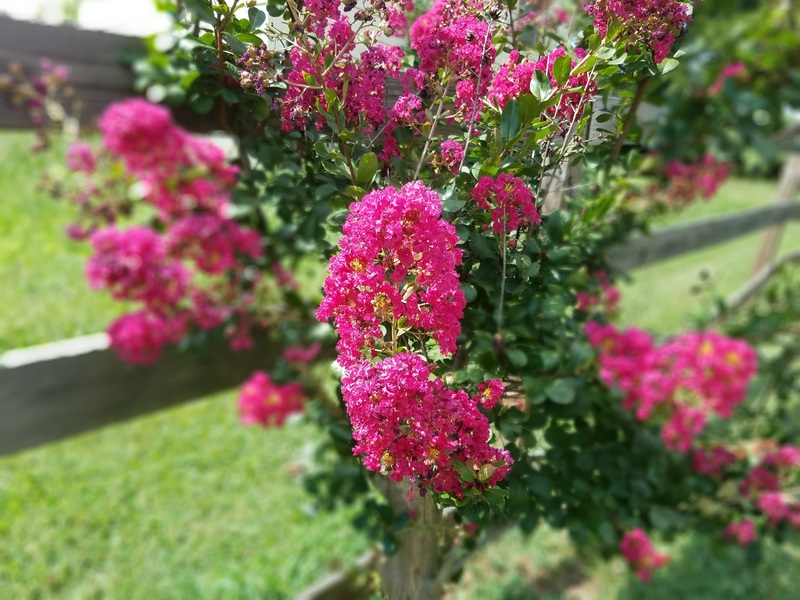 Taking pictures with the 12MP back camera has been nothing but a joy. On bearably hot days, I headed outdoors to take some photos. 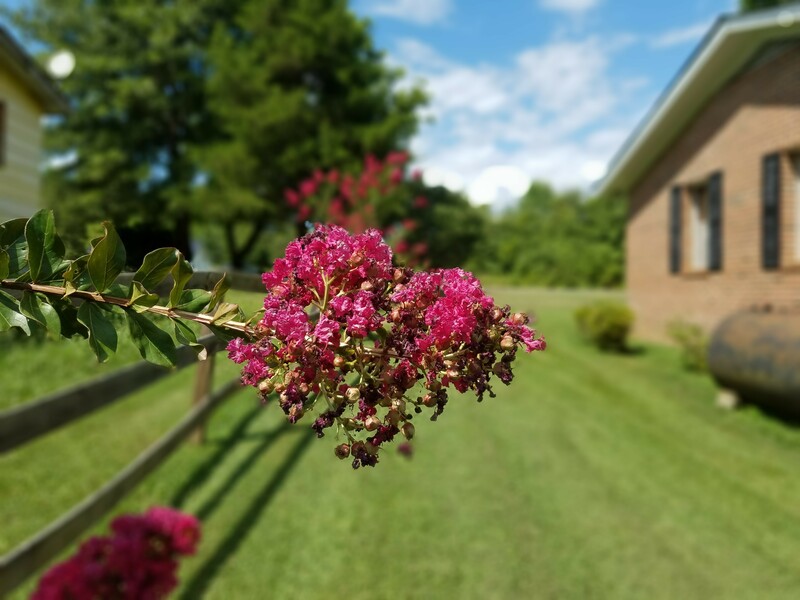 Using Selective Focus, I crafted some beautiful shots that may end up on the cover of “Better Homes and Gardens” one of these days. 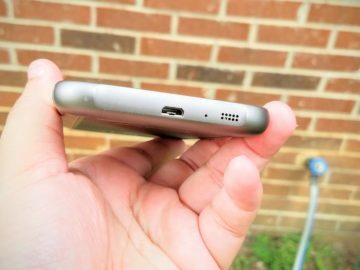 As always, you can view the photo gallery at the end of this review to see the camera quality, but you needn’t look any further than the 3,100mAh wireless charging battery pack review for the Galaxy S7 edge to see additional proof of the S7 Active’s 12MP back camera prowess. Most reviews give a list of pros and cons and then carry on their merry way. I don’t want to do that. I wanted to cover the aspects of the phone that would matter to any diehard tech enthusiast or inquiring consumer. Now that the typical ground has been covered, it’s time to discuss what’s to like and what’s not to like about this handset. First, the shatter-resistant display and ruggedized build are an old-fashioned favorite. I know, I know: I live in a high-tech era I’ve come to embrace (I do own lots of 2016 high-end Android smartphones), but there’s something to be said for the consumer that doesn’t mind a ruggedized build and shatter-resistant display and find the S7 Active attractive. Samsung has designed it that way, and there’s nothing wrong with liking Samsung’s design language (a number of consumers do, which is why Samsung dominates in Android). The display is only shatter-resistant to about 5 feet, but that will suffice for most individuals who don’t drop their S7 Active from airplanes in torture tests on a consistent basis. The shatter resistance and rugged build go together in this instance because Samsung added them to ensure durability. Having a rugged build with a vulnerable display is incompatible. 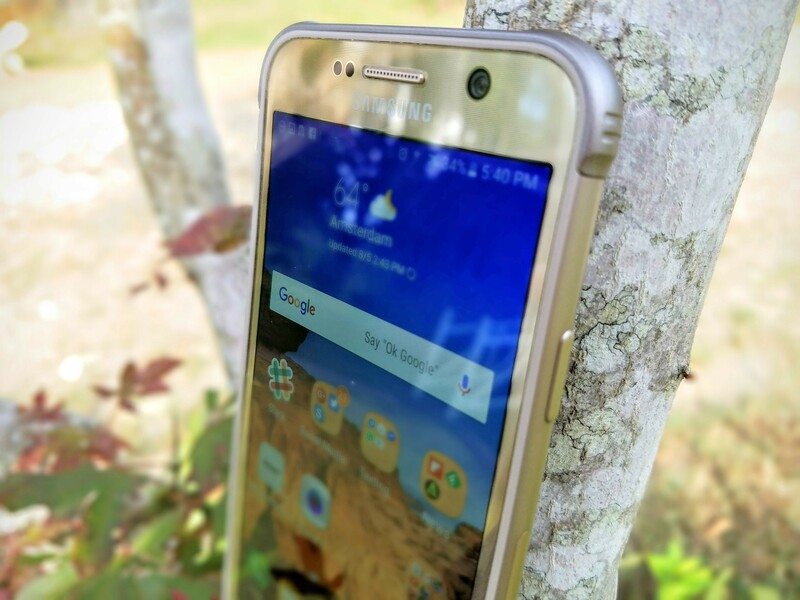 This year’s Galaxy S7 Active, though, is the most beautiful yet, with Samsung creating a Sandy Gold option that is the best of the bunch. I’m not a fan of the Green Camo, as I believe that you don’t need Camo print on the back of a phone to ensure that it’s rugged (it’s more noisy decoration to me, like the bolts on the back of the Galaxy S6 Active, than anything else). The black color is typical, and with all the black and white-colored phones on the market, having a Gold option this year gives the S7 Active a finesse that it hasn’t had since the inception of the Active line with the Galaxy S4 Active. Kudos to Samsung for improving the design and making the Active attractive. After getting UFS 2.0 and microSD storage to play nicely together, Samsung has integrated them both into the S7 Active. If you’ll recall, the S6 Active did not have a microSD card slot, so Active customers will appreciate its return here. Samsung launched Samsung Pay in 2015 with the Galaxy S6 and S6 edge, bringing it to the Galaxy S6 edge+ and Galaxy Note 5 by year’s end. And yet, the Galaxy S6 Active arrived on the market sans Samsung Pay (though Android Pay was added to the S6 Active in Lollipop post-launch). Samsung Pay allows customers to make purchases on their mobile device in nearly any location that has a credit card terminal, which means that at least 90% of all businesses are Samsung Pay-compatible. After denying it to the Active lineup in the same year that the Korean giant introduced it in the S line, Samsung finally brings it to Active smartphone users in the S7 Active. Of course, Google’s Android Pay is still a mobile payment option, but Samsung Pay is far more convenient and should be the preferred mobile payment system of Galaxy S7 Active users. Some prefer capacitive buttons or software buttons on-screen rather than physical buttons, but I have always loved Samsung’s design that incorporates a physical home button. In Active phones past, it was always jarring to use an Active smartphone with its 3 physical buttons after using the physical home button/capacitive buttons of Samsung’s S and Note phones, but the S7 Active’s physical keys are just “clicky,” pleasant to use, and no longer make you feel as if your fingers are “trudging through mud” to use them. Samsung has been working hard at making the experience more intuitive, and the company does that here: physical buttons that are as easy to use as any flagship in the Galaxy. The Galaxy S6 Active did not have a charging time indicator, and this remains true, unfortunately, even with the Galaxy S7 Active. In other words, if you place your phone on the micro-USB cable or fast charge the device wirelessly, you’ll still have to take a guess at how long your phone will take to charge from 0 to 100%. The Galaxy S6 Active lacked Gear VR support, and Samsung has denied Gear VR support once again in the Galaxy S7 Active. The VR headset announced with the Galaxy Note 5 last Fall isn’t compatible with the S6 Active or S7 Active, and Samsung has said next to nothing about the S7 Active’s Gear VR compatibility this year (which suggests to me that there is no Gear VR compatibility for it). Consumers who don’t care for virtual reality and just want an element-resistant handset won’t mind this, but consumers who want to spend $800 and get the same experience as their more fragile-flagship counterparts won’t find it here (at least with VR, anyway). 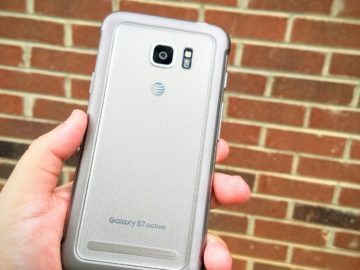 I’ve said it before but I’ll say it again: the Galaxy S7 Active’s top drawback is that it still remains an AT&T exclusive. It’s a marvelous phone with a character all its own, but the majority of Samsung fans worldwide can’t enjoy what the S7 Active brings because you can only get it if you live in the US. You can buy the device outright, but you’ll have to go through AT&T in order to get Android updates that are mandatory to keep the device in good health, such as the recent WiFi Calling update AT&T delivered to S7 Active users a month ago. I’ve said it before that I think Samsung would do even better to offer the Active series to customers worldwide without exception, but it seems as though the S7 Active has proven lucrative for AT&T. There was a time when I would never have even reviewed a device that was exclusive to just one carrier, but the S7 Active is worth it. It’s so good that you’ll find yourself even more frustrated with Samsung for releasing it on just one carrier. 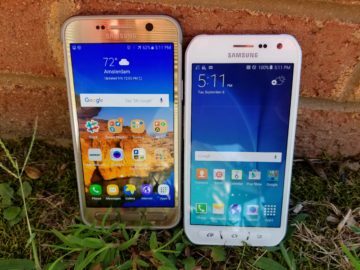 In my humble opinion, the Galaxy S7 Active is the true rival to the Galaxy S7 edge — not the regular Galaxy S7. Sure, the Galaxy S7 Active is pretty heat-resistant, but its element resistance is limited. 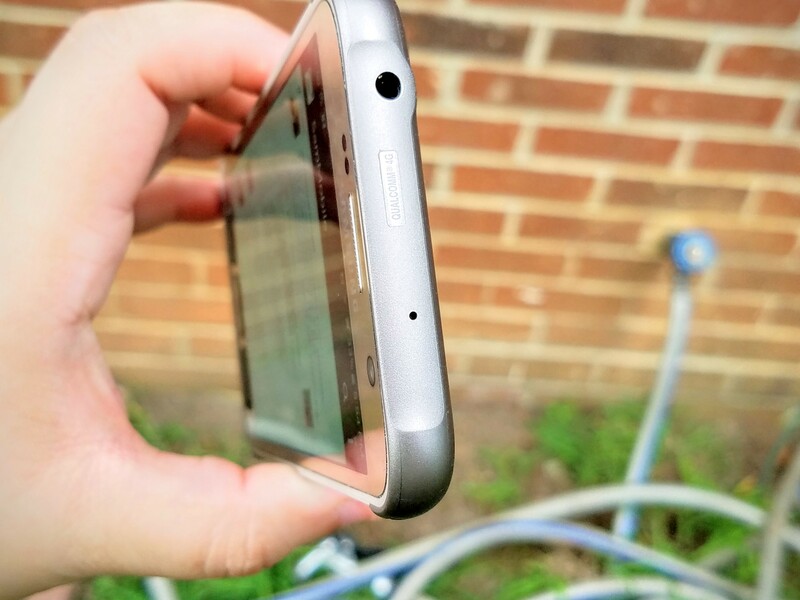 I didn’t mind sitting it on the ground in the dirt or even dropping the phone in the grass, but placing the S7 Active on some shingles in the yard lead to me creating a clearly defined scratch across the back of the Galaxy S7 Active. 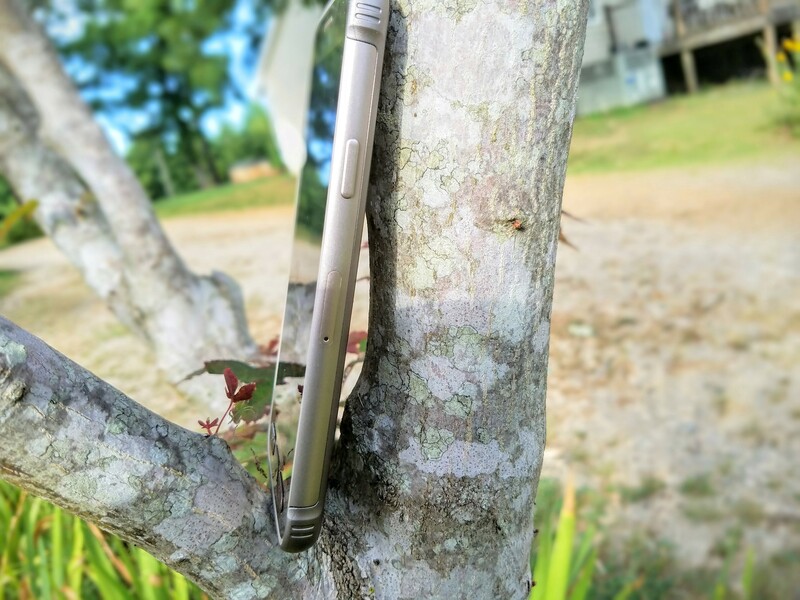 With that said, the phone is rugged, but it isn’t necessarily rugged in every situation outdoors. Some materials, like roof shingles, sandstone, or even cement may not necessarily leave the phone unscathed. You can see the material responsible for my scratched S7 Active in the comparison photos below. 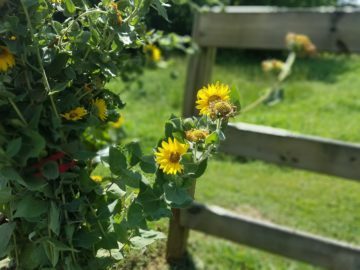 The Galaxy S7 Active has been a joy to use these last several weeks, and it is my hope that any consumer who buys it will have as pleasant an experience. The Galaxy S7 Active doesn’t have Gear VR support, doesn’t have a charging time indicator, and remains stubbornly an AT&T exclusive, but Samsung has improved the wired and wireless charging times, all while maintaining camera performance, the world-best AMOLED display, and incredible battery life. I didn’t have to carry the S6 Active in a case or use a screen protector, and this year’s Galaxy S7 Active is just as formidable and just as unapologetically bold in the elements. 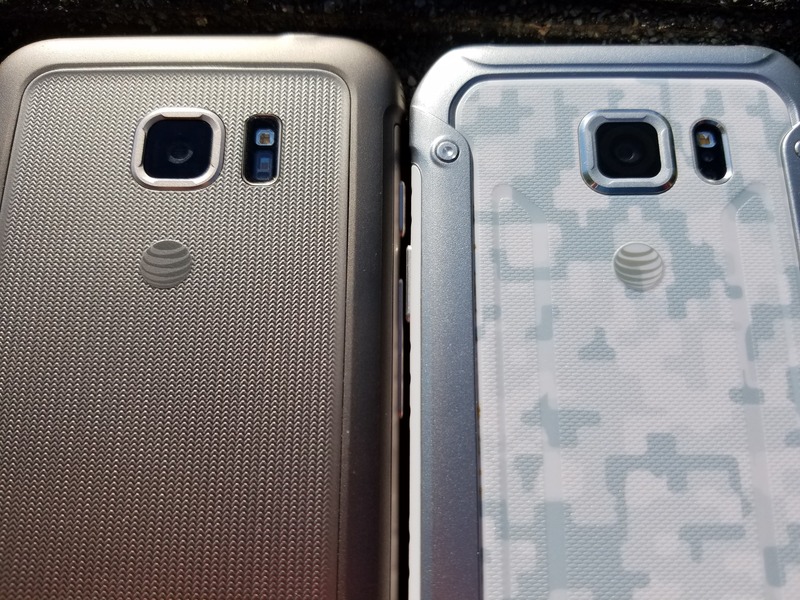 Alongside of all these positives, Samsung has given the S7 Active a gorgeous Sandy Gold color that will make you say goodbye to the Titanium Gray and Green Camo versions for good. 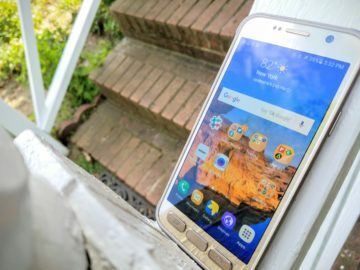 The S7 Active isn’t perfect, which is no surprise to anyone who reads reviews and writes them, but it is definitely the “Gold” standard of the Active series. 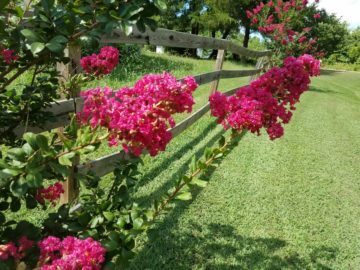 And the best part of it all is that buyers can enjoy this year’s take while waiting for an even better experience in 2017. 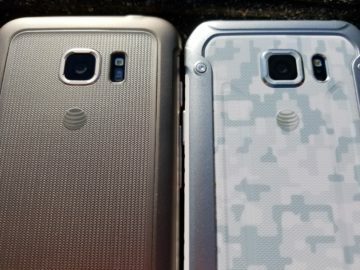 As for the device itself, expect to pay $26.50 a month with AT&T on a monthly installment plan and choose between Titanium Gray, Camo Green, and Sandy Gold colors, or fork over $795 off-contract for the Galaxy S7 Active. Its price is rather steep at nearly $800, but it’s the best $800 you’ll ever spend. Another one who love ruggeds… i also think ip68 should be standarized soon: but its sad and true; Sansumg has gone to the dark side with those prices… i m checking those agm … are they really that good? I have been seeing some cool specs in the X1 gold edition for the price :O !! i MUCH prefer the design of this than all the fragile shiny glass thats about now. if you spend flagship money, you want it to last !!! Wow.. but well; those prices dont surprise me anymore Deidre, hahaha. for me, not really “… as hell” but, yes it’s ugly. UGLY like hell…….WHY DO such a bad looking phone.